If you’re looking for trading opportunities, energy exchange-traded products (ETPs) might be for you. However, there is a lot to understand about energy exchange-traded funds (ETFs) and exchange-traded notes (ETNs). You see, there are a lot of factors that affect these products, such as politics, global economic factors, and supply and demand. Additionally, other catalyst events like the EIA Petroleum and Natural Gas Status reports would affect the crude oil ETF and natural gas ETF. Now, the main energy ETFs out there are The United States Oil Fund (USO) and The United States Natural Gas Fund (UNG). There are also leveraged energy ETNs tracking natural gas prices. These include the VelocityShares 3X Long Natural Gas ETN (UGAZ) and VelocityShares 3X Invest Natural Gas ETN (DGAZ). That said, let’s take a look at the inner workings of these energy ETFs and ETNS. 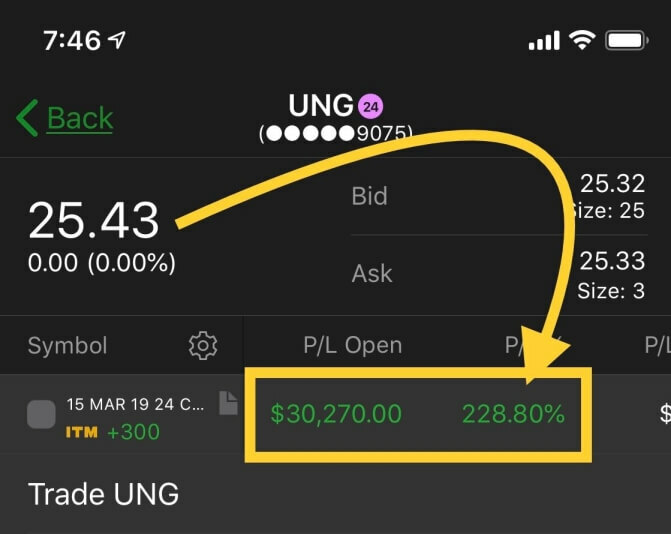 Although there is a lot to learn about these products, I’ve discovered a simple, yet effective way to multiply my money in energy ETFs like UNG. For example, here’s a look at just one of my trades in UNG. 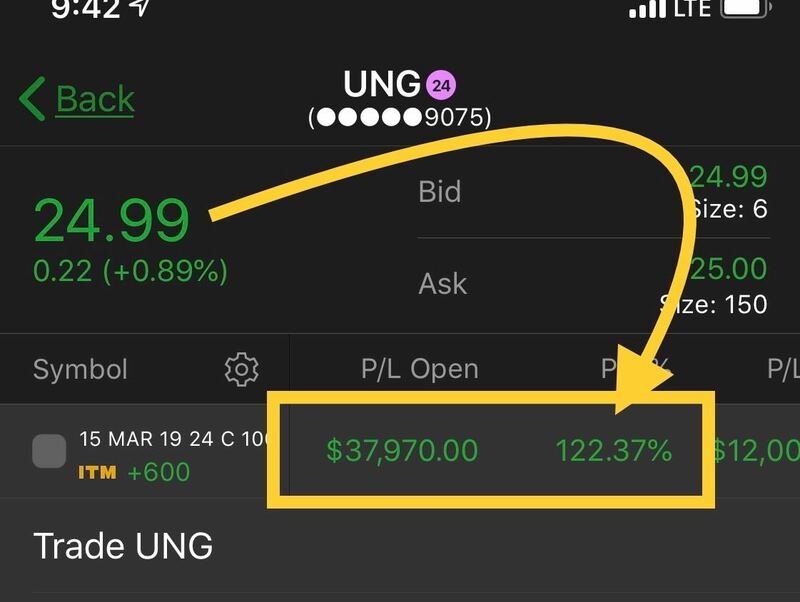 Want to Learn How I made 200%+ in UNG? Now, before I walk you through the trade in UNG, let’s look at some factors affecting crude oil prices, as well as natural gas prices. If there is more supply than demand, crude oil and natural gas prices tend to fall. If there is more supply than demand, natural gas and crude oil prices tend to rise. When there’s political unrest, changes in government leaders, potential wars, or other political events, it would affect crude oil prices, which trickles down to natural gas prices. In general, these events tend to drive prices higher. When temperatures get colder, we tend to see natural gas and crude oil prices rise. If there is a natural disaster affecting an area that produces crude oil… well, you could guess there would be less supply, which would cause a spike in prices. When there is hot weather, this increases the demand for cooling… in turn, this increases the demand for natural gas used by power plants. That would drive natural gas prices. Remember, these are not the only factors affecting crude oil and natural gas prices. That said, make sure you conduct your due diligence before considering USO, UNG, UGAZ, or DGAZ. 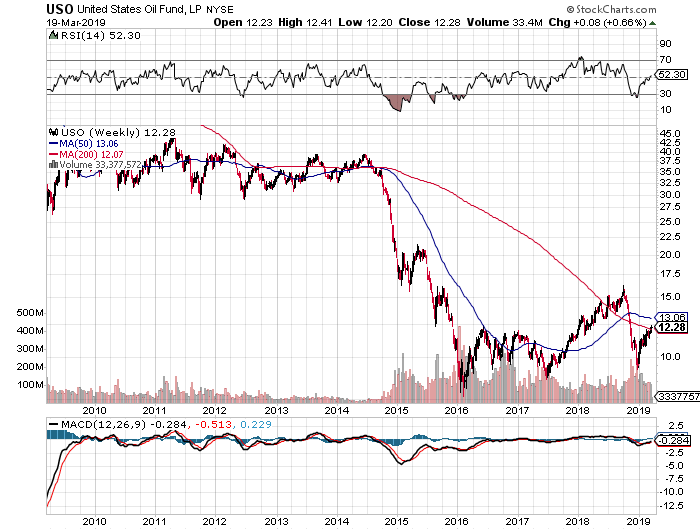 Now, let’s take a look at a crude oil ETF – the United States Oil Fund (USO). The United States Oil Fund aims to track the daily performance of West Texas Intermediate (WTI) crude oil. Now, WTI crude oil is considered “light and sweet” crude oil. Additionally, it’s considered medium-grade crude oil. USO specifically aims to track the daily percentage changes of WTI crude oil. In other words, if WTI crude oil is up 1% in a specific day, USO would be up around 1% that same day. In order to achieve these objectives, USO holds front-month futures contracts on WTI crude oil, as well as cash and cash equivalents. In addition to WTI crude oil futures, USO may invest in other oil-related futures, as well as forwards and swap contracts. Don’t worry if you don’t know what these terms mean… I’ll show you one way to trade this crude oil ETF and a natural gas ETF (UNG) later. That said, USO would be suitable for those who want exposure to WTI crude oil prices… but do not know how to trade futures contracts. Here’s a look at a long-term chart of USO over the last 10 years. If you look at the chart above, you can see… over the long term, buying and holding this crude oil ETF would have been detrimental to your account. This marked my first big win…. and I actually played conservatively, because I have kind of blown up a previous account. I work full time, so the ONLY type of service that makes sense is one like your Weekly Money Multiplier, because using your recommendations, I can watch, learn, and enter when I think it’s appropriate… Since I’m trading at work, I can subtly watch things on my phone and then enter trades or do whatever else is necessary on my PC… but I simply can’t be available there all day long. I am so grateful and thankful… I have hoped for a service like this, and for ME, this is IT!! 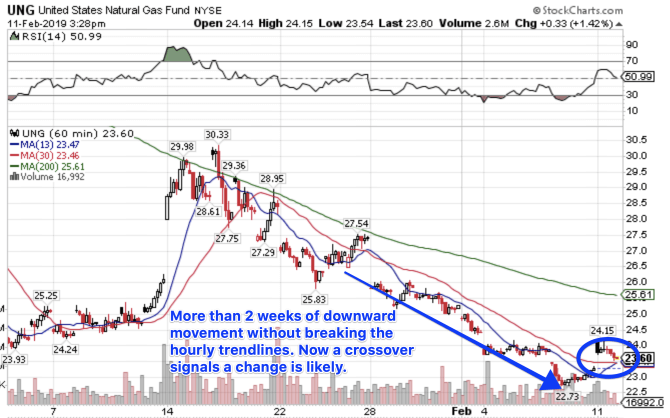 Moving on, let’s take a look at a natural gas ETF, UNG. 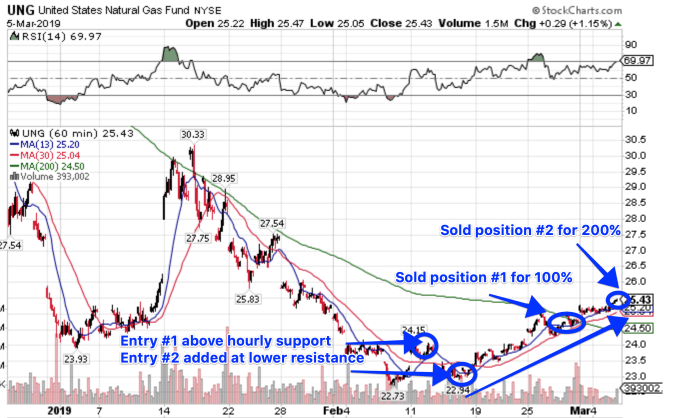 Now, traders usually thing of the United States Natural Gas Fund (UNG) as the sister fund of USO. However, UNG aims to track the daily percentage changes of natural gas prices. For example, if natural gas prices fall by 1%… then UNG would fall around 1%. More specifically, UNG uses futures contracts for natural gas to be delivered at Henry Hub, Louisiana to measure these daily percentage changes. Basically, UNG does what USO does… but with natural gas instead of WTI crude oil. Now, it’s great to learn about these ETFs, but how can you put this into action? Notice how the blue line looks like it’s going to cross above the red line. Well, that’s known as the “money pattern”… something I use for nearly all of my trades. Well, just by using that indicator, and understanding the macro environment… I was able to spot this shift in trend, as shown below. Moving on, let’s look at some leveraged and inverse leveraged natural gas products. Before we get into the details of UGAZ and DGAZ, there’s something you need to understand about these products… they can be risky. You see, these exchange-traded notes (ETNs) provide three times leverage for a single day. For example, if natural gas prices rise by 2%, UGAZ would rise by 6%, while DGAZ would fall by 6%. Not only that, these ETNs are only for short-term traders. If you buy and hold UGAZ or DGAZ, chances are that the percentage performance will differ from what you expect. UGAZ and DGAZ could be thought of as up-gas and down-gas, respectively. If gas prices rise, it favors UGAZ. On the other hand if gas prices fall, it favors DGAZ. Basically, these ETNs aim to amplify the performance for natural gas futures contracts for delivery at Henry Hub, Louisiana traded on NYMEX. That said, some traders think of these ETNs as three times leveraged UNG products. As always, before you consider trading these products, make sure you conduct your due diligence. One way to trade USO or UNG would be to trade options, like I do. Using options to trade these products allows you to achieve better risk-reward levels, and the profit potential could be immense.